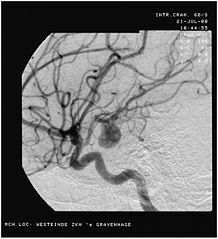 In order to prevent Medical Malpractice, observation should be the treatment of choice for all stable brain aneurysms including the smallest ones as all brain aneurysms, even those smaller than the current 7-mm treatment threshold, have 12 times more of a chance to break and lead to a catastrophic brain injury or death if they are growing in size according a recent study published in the Journal of Radiology and lead by J. Pablo Villablanca, M.D., chief of diagnostic neuroradiology at the David Geffen School of Medicine at the University of California, Los Angeles. The study also demonstrates that Aneurysm growth, size, and smoking were associated with increased rupture risk. 30,000 Americans each year suffer ruptured brain aneurysms and 40% of them die. Among the survivors, two-thirds suffer permanent neurological damage. A cerebral aneurysm is a growth in a blood vessel in the brain. If it breaks, blood is leaked into or around the brain, which can cause brain damage or death.